I remember Pomeroy's they are long gone along with Wanamaker's, Strawbridge and Clothier and Gimble's. I must say you look adorable and quite styling in your beautiful coat and hat! Very cute! Your Eagles sure looked fabulous yesterday when they killed the Bears. Now on to the Cowboys! I love that picture, Nanette! You are just the cutest thing ever. I can see that love just shining out of your eyes. You are the cutest thing EVER. Merry Christmas Nanette! Now that is a face of a true believer, you little cutie pie. Have a wonderful Christmas . That's adorable Nanette! Merry, Merry Christmas to you and your Sweet family! This is a beautiful photo !!!! I loved going to the departments stores in Paterson, NJ, with my mother. We'd get the bus on our corner and have a fun day shopping and eating lunch out and visiting Santa. 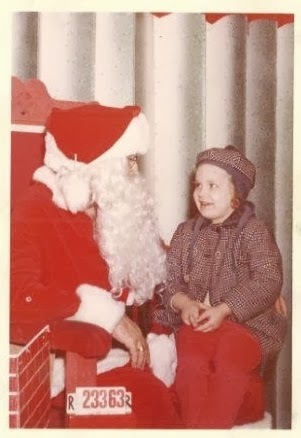 Thanks for sharing your photo and helping me to recall some of the best memories of Christmas past. I love that photo...too cute! Merry Christmas to you and your family! Wishing you and your family a most blessed and Merry Christmas. aww.. your expression is priceless! So sweet!! Adorable photo and a very very cute outfit! Hope you had a beautiful Christmas! What a great photo! And what an adorable child you were!